Health, Safety, & Security Archives - strategic HR inc.
By David Powell with strategic HR inc. Unfortunately, there have been an increased number of active shooter incidents across the country. With the increase in number, it becomes even more critical to ensure we help prepare our employees should the unthinkable happen. However, many employers are unsure where to begin to help prepare their employees for a potential active shooter event. We’ve all experienced firsthand the tornado and fire drills to help prepare us should one of these events occur. Active Shooter Training is no different. It is important for employees to understand the company plan and options to prevent mass panic if an active shooter incident did occur. One of the first things an organization needs to do is to determine the threat level to their place of business. Are there clear threats that could be identified? Is your place of business at higher risk such as late-night retailers, liquor stores, and even banks? Is there a former employee, disgruntled customer, or is there an employee that has problems with a husband, wife or former boyfriend that could threaten your organization? Sadly, there does not seem to be a clear answer to this question. Many businesses that have been the victims of this type of attack really have very little in common. There have been attacks at movie theaters, airports, labor offices, and trading companies just to name a few. The key to increasing your odds of surviving an active shooter event is to have a plan. How will you notify your employees that an event is happening including employees at the location and employees that may be off site? Do your employees know where all the exits in your facility are? Do you have an accurate list of your employees and how you will account for them? Who will contact the local authorities? Remember that rehearsing the plan is just as important as the development of the plan. The first few times you rehearse you may identify shortfalls that you may want to add to the plan, and that’s okay. The more you run through the rehearsals, the quicker it will become and the more comfortable your employees will become with it. Awareness: When was the last time you were walking along looking at your phone and not paying any attention to what was going on around you? It is important to take steps to become more aware of your surroundings to be able to recognize if anything isn’t “normal”. And also, like on an airplane, you need to be aware of your exits should an incident occur. Run: If you would ever find yourself in an active shooter situation, look at your options and assess if running may work. If running is an option, go – go as fast as you can. Don’t worry about taking personal items with you. And, if you can, urge others to join you as running is your best chance to survive. You may even have individuals that will freeze in the situation and you’ll need to pull them along. Get out and get safe! Hide: Unfortunately, running may not always be an option for you. If you find yourself in this situation, look for a place to hide that is out of sight and could even block gunfire. If possible lock or barricade the door. Remember to silence your cell phone. Fight: Even if you hide, you may find you have to fight back. Look around for any type of object – blunt, sharp or even something to throw at the shooter to distract them. If you are with a group of people, work together to overpower the shooter. In all four of these situations, call 911 if you are safely out of the building or hidden. You may have to make the call on a cell phone. Remember, 911 may not know where you are on a cell. So, be ready to provide details and any details you know about the current shooting incident. The reality of gun violence is that it is not new. However, there is not necessarily legislation requiring employers to take action. In the event of an active shooter, the Occupational Safety and Health Administration (OSHA) will come in to evaluate what happened and how it may have been prevented. OSHA has the ability to penalize employers if reasonable steps to maintain a safe workplace were not in place. What the agency considers “reasonable” is subjective and will depend on the specifics of each case. But, no matter how much an employer tries to keep their employees safe, they cannot prevent every possible event. A “No Weapons Allowed” policy in the company handbook or a “No Guns Allowed” sticker on the front door are good steps but are not going to protect employees, when an active shooter event occurs, which could be at any time. It is important for the company to recognize that the threat is real, and they need to do as much as they can to protect their employees. It is important for the company leadership to support the development and training of a realistic Active Shooter Plan that meets their company’s specific needs and prepares their employees for surviving the unthinkable. Have questions about this article or need help developing your Active Shooter Plan and Training, contact strategic HR inc. at info@strategicHRinc.com or 513-697-9855. strategic HR inc. is fortunate to have two well trained experts on staff to help customize your plan and training. The dependence on prescription painkillers and synthetic opioids has exploded into a full-blown epidemic in America. The problem is a 50-state issue that public health officials are calling the worst drug crisis in the American history. Opioids aren’t without a purpose: They’re an effective way to manage pain when prescribed by a physician and taken as indicated. However, the entire class of drugs is highly addictive. When a prescription runs out or is too expensive to maintain, some people may turn to using cheaper street opioids. In 2014, the U.S. Department of Health and Human Services (HHS) made the epidemic declaration. That year, more people died from drug overdoses than any other year on record with more than six out of ten deaths involving opioids. The history of the crisis is interesting to review and provides perspective on how the situation has gotten to this point. Throughout the 1970s doctors and nurses were trained to provide minimal opioids for pain, unless death appeared imminent. In the ’80s, a group of prominent pain management specialists began promoting the idea that restraints on prescribing opioids were unnecessary and even cruel. Kathleen Foley of New York City’s Memorial-Sloan-Kettering Cancer Center wrote two highly influential articles reporting on the low incidence of addictive behavior in small cancer and noncancer patient groups. These articles, and other efforts, started a 20-year campaign for the long-term use of opioids for the treatment of pain in noncancer patients. Purdue Pharma marketed Oxycontin as nonaddictive and safe since it was released within the body over a 12-hour period. However, recreational users learned to use Oxycontin to achieve highs by crushing or dissolving the pills or by taking large doses. Both pill mill operators (unethical doctors who prescribe hundreds of pills without medical justification) and well-intentioned general practitioners wrote a high number of prescriptions for this drug. 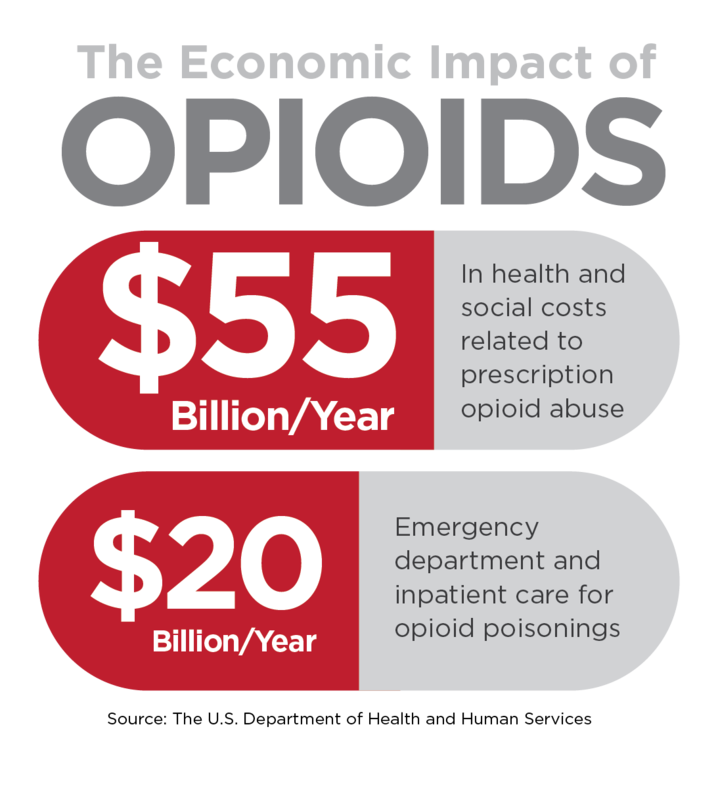 As the number of opioid prescriptions grew from 76 million to 219 million between 1991 and 2011, the impact on families, communities and business became devastating. Many experts who initially called for the liberal use of opioids to treat chronic pain began reversing their support due to the alarming reports of abuse and addiction. 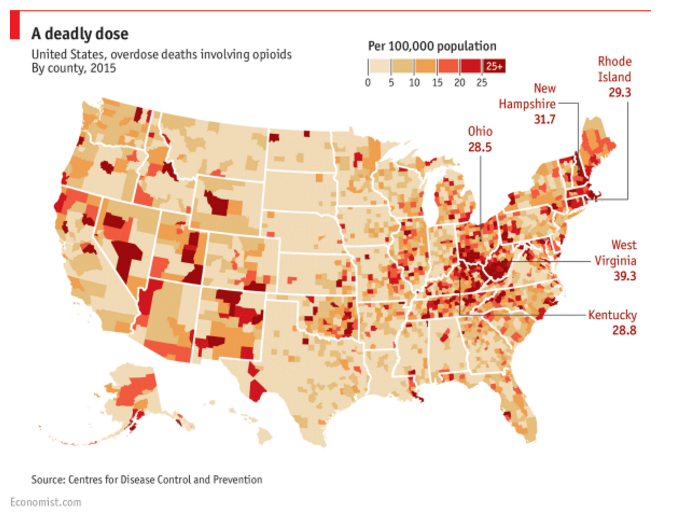 While the number of deaths is highest in major cities, such as Chicago and Baltimore, the greatest overall impact is in Appalachia, New England and the Midwest. Ohio has been one of the most hard-hit states. The epidemic has strained the resources of law enforcement and the criminal justice and healthcare systems. Ohio’s publicly-funded addiction treatment services are also stretched thin. Individual states have tried to crack down on prescription opioid abuse through legislative efforts, setting in-office physician dispensing limits, licensing pain management clinics (pill mills), and establishing patient safety and education programs. Forty-seven states, including Ohio, Indiana and Kentucky, have established Naloxone Distribution Programs. Naloxone is a drug that reverses heroin’s effects on the brain and jump-starts breathing for overdose victims. The Food and Drug Administration (FDA) approved its use in 1971, and doctors and paramedics routinely have used the drug since then. The distribution programs also provide overdose training and take-home naloxone doses to people considered high risks. How Is This Affecting Companies? This epidemic is having negative effects on businesses, as well as within families and communities. Businesses need to take steps to protect their reputation and profitability. Employees with addictions function at about 75 percent productivity, so the direct cost to companies is 25 percent of salaries on that factor alone. The first step for business leadership is to review or institute a drug-free workplace program with policies and procedures in place for all employees. A drug-free workplace helps prevent the hiring of illegal substance abuses and helps deter current employees from substance abuse. Business leadership can visit the Institute for a Drug-Free Workplace for more information on establishing a drug- and alcohol-abuse policy. For current employees, companies are encouraged to support rehabilitation programs for improved recovery rates. Insurance often covers 30-day inpatient programs although much longer treatment periods are needed typically. The opioid epidemic is taking a toll across America on individuals, families, businesses and communities. Despite efforts, recent data show that the United States is still in the throes of the opioid epidemic. Naloxone programs are preventing a small percentage of overdose deaths, but the rising use of fentanyl – a synthetic opioid painkiller that’s 50 to 100 times more powerful than morphine – is contributing to the situation worsening. The fight against opioid abuse and its effects will continue for many years. 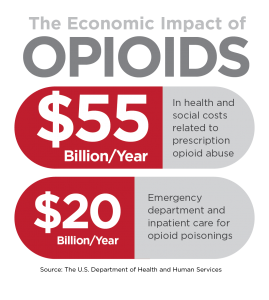 The combined efforts of individuals, community organizations, government legislation and programs, and employers will help the country reverse the abuse of prescription and street opioids. Meldrum, ML. The ongoing opioid prescription epidemic: historical context.American Journal of Public Health, 2016:106(8), 1365. Quinones, S. Dreamland: The true tale of America’s opiate epidemic.New York, NY: Bloomsbury Press; 2015. Mars, SG, Bourgois, P, Karandinos, G, Montero, F, & Ciccarone, D. “Every ‘never’ I ever said came true”: transitions from opioid pills to heroin injecting.International Journal of Drug Policy, 2014;25(2), 257-266. Thank you to Signet Screening for sharing this article. Their services include federal, state and local criminal checks, education and employment verifications, drug screens, motor vehicle, and social media searches. For more information contact Signet Screening or call 513-330-6695. Note: This material is not intended as legal advice and is for general informational purposes only. Those seeking legal advice should consult directly with legal counsel regarding their specific facts and circumstances. Employers have been hard hit by the soaring costs of providing employees with health care benefits. Recent studies indicate that almost 50% of corporate profits now go for health care costs versus only 7% three decades ago. (1) Employers are actively seeking new ways to reduce health care costs without jeopardizing their ability to attract and retain workers. These factors have prompted many organizations to assume positive positions on the issue of health promotion at the work-site. Employee wellness programs have long been advocated as a way to decrease healthcare costs, reduce absenteeism, and increase productivity. Wellness programs are defined as programs designed to maintain or improve employee health before problems arise. A review of corporate wellness programs conducted by Goetzel et al. reported that comprehensive disease management programs yielded the highest return on investment. (4) Their findings suggest the need for health education, early detection, and appropriate interventions and health programs in order to maximize returns from investments in wellness programs. Companies need to identify at risk employees and provide interventions that encourage life style changes that can reduce their risks. Costly health problems such as cancer, chronic pulmonary disease, cardiovascular diseases and others are related to behaviors and life choices. (5) Changes in behavior have been shown to have a significant effect in reducing the incidence of these diseases. Many companies now conduct health screenings at the office or plant site, others reimburse employees for the cost of annual checkups and other exams. Companies have found that while early detection may cost $15,000 in surgical costs, the health care costs for acute disease are much higher averaging $40,000 per incidence. Johnson & Johnson reported that it spends $4.5 million each year on its comprehensive preventive health care programs but it estimates that without these programs their medical bills would be at least $13 million higher. Extensive studies by researchers at the University of Michigan Health Management research center indicate that as employee risks go up or down, the change in costs to a company follow in the same direction. (6) Health risk appraisals are, therefore, an essential component of a successful wellness program. A profile of the current health status of employees allows the company to use resources for targeted programs that will maximize health benefits. Once health risks have been identified, wellness programs can be developed or revised to meet the prevalent needs within the employee population. It is equally important to design programs to prevent low risk employees from adding risk factors over time in order to reap the long -term benefits of a wellness program. Although improvement in an individual’s ability to perform work is somewhat difficult to quantify, several researchers have studied the impact of exercise on job performance. For example, NASA found that while the productivity of non-exercising office workers decreased 50% during the final two hours of the work day, exercisers worked at full efficiency all day. (7) This amounts to a 12.5% difference in productivity between the two groups. Several industry studies have demonstrated reductions in absenteeism and disability time as a result of employee wellness programs. The reduction in absenteeism varies but most organizations implementing comprehensive wellness programs have seen improvement in this area. While studies at Dupont and General Mills found 14 – 19% reductions, General Electric reports an astounding 45% decrease in absenteeism. (8) Studies have also shown that wellness programs have a positive impact on recruitment and retention of high achieving employees. Gains were larger when incentives were used to encourage participation. Medical claims decreased by an average of $100- $400 per year relative to participants in control groups. Cardiac risk factors were lowered in wellness program participants. Heirich and Associates studied the impact of several programs on cardiac risk. This study found a 35%-45% reduction in overall cardiac risk among participants in physical fitness program participants over a three- year period. (10) Chapman found that those wellness programs that address cardiac risk factors yielded high cost-benefit ratios. (11) The most effective programs reviewed involved access to a fitness facility, outreach, personal counseling, dietary consultation and organizational changes that facilitated work site exercise. Larry Chapman, MPH conducted a cost- benefit analysis of work-site wellness programs by conducting an objective assessment of 34 of the most valid evaluation results for multi- component wellness programs. The assessment examined various types of programs and whether or not they had a significant impact in altering employee behavior and reducing health care costs to the organization. The analysis revealed strong evidence that programs targeting hypertension control, physical activity, nutrition and tobacco use were effective in altering employee behavior. Programs targeting hypertension control were found to have the greatest impact on health care costs. High-risk intervention and multi component programs were found to alter employee behavior and were associated with reduced health care costs to the organization. Chapman concludes that employee wellness programs based on sound program design strategies that are effectively implemented, can reduce health risks in most employee populations and result in significant economic benefit to organizations. The research also indicates that magnitude of the results is positively correlated to the extent of the programming. Erfurt, Foote and Heirich estimated that a comprehensive worksite wellness program costs an employer between $70 and $130 per employee annually (in 1992 dollars). (12) In this estimate the researchers included both direct and indirect costs. Costs vary depending on the size of the organization and the “extent of the facilities and programs offered.”(13) Even the simplest of these programs have demonstrated reduction in health care costs, inpatient stays, and sick leave, with a cost/benefit ratio of 1: 4.73 (Leigh,et al). Assessment Activities that are used to determine employee health. Results are used to identify health risks and provide insight to employers as to what the most pressing issues are in their organization. Health Screenings for early detection and treatment of health problems. Communication materials such as newsletters, paycheck stuffers, posters and bulletin board notices must be distributed on an ongoing consistent basis to provide accurate wellness updates. This is especially important for multi-employer organizations who may find it difficult to reach employees working at different work-sites. Self-help materials should be readily available. Include “self- care” programs geared towards teaching employees to become wiser consumers of their health care benefits. Some examples of self-care programs include; self-care workshops, nurse advice lines, self-care software, educational and promotional materials. “Studies show that about 75% of people who receive a self-care guide will use it at least one time within six months.” Of all the items included in implementing a wellness program the inclusion of self-care appears to provide the most consistent return on investment. The use of incentives to reward people for healthy behavior has been shown to be tremendously effective. Motivation is the key to success. Involve the employee’s family. “Employees account for only about 30% of health care cost, while dependents account for the remaining 70%.”(15) In spite of this fact, only 30% of programs reviewed offered participation to spouses and dependents. It is important to identify hazardous working conditions and make changes before a program is implemented. On- going evaluation is critical to the long -term success of a wellness program. Offer healthy foods in the cafeteria and/ or vending machines. Offer flextime for employees that want to exercise at lunch- time. Provide showers and a locker room at the work-site. Provide information to employees by distributing free brochures and wellness newsletters. Encourage employees to register for free electronic health newsletters. Provide partially reimbursed memberships to off site health facilities. Becoming proactive in your employees health makes good business sense. Promoting wellness programs can have a substantial impact on profitability by reducing health care costs, increasing productivity, decreasing absenteeism and by providing a positive, healthy work environment. Wellness programs may be one of the few employee benefits that pays money back to the organization. (1) McDougall, Diane. “Feeling Stressed?”, CMA Management. Vol. 73, No.9 (pg 14) November,1999. (4) Goetzel,RZ, et al. , “What is ROI? A Systematic Review of Return on Investment Studies of Corporate Health and Productivity Management Initiatives.” AWHP’S Worksite Health. Volume 6, 1999. (5) Glik, Deborah C.;Kronenfeld, Jennie J. & Jackson, Kirby. “Predictors of Wellness: Role Performance Behaviors”, American Journal of Health Behavior, Volume 20, 1996. (6) “The Ultimate 20th Century Cost Benefit Analysis and Report”, University of Michigan Health Management Research Center, March 2000. (7) Fielding, J.E., “Getting Smarter and Maybe Wiser”, American Journal of Health Promotion, Volume 11, 1996. (9) Shephard, R.J., ” A Critical Analysis of Work-site Fitness Programs and their Postulated Economic Effect”, Medicine and Science Sports and Exercise. October 1991. (10) Heirich, MA, Foote A, Erfurt JC, et al. : Work-site Physical fitness programs: comparing the impact of program designs on cardiovascular risks. Journal of Occupational Medicine, 1993. (11) Chapman, L., Proof Positive: Analysis of the Cost Effectiveness of Wellness, 3rd Edition. Seattle: Summex Corporation, 1996. (12) Erfurt, J.C., Foote, A., Heirich, M.A., ” The cost effectiveness of worksite wellness programs for hypertension control, weight loss, smoking cessation and exercise”, Personnel Psychology, Volume 45, 1992. (13) Erfurt, J.C., Foote, A., Heirich, M.A., ” The cost effectiveness of worksite wellness programs for hypertension control, weight loss, smoking cessation and exercise”, Personnel Psychology, Volume 45, 1992. (14) Chapman, L., Proof Positive: Analysis of the Cost Effectiveness of Wellness, 3rd Edition. Seattle: Summex Corporation, 1996. (15) Powell, Don R. “Characteristics of Successful Wellness Programs”. Employee Benefits Journal, (pp 15-21) September, 1999. World Health Organization Announces 2009 Pandemic Influenza – Are you Prepared? On June 11, 2009, Dr. Margaret Chan, Director-General of the World Health Organization announced the first global flu pandemic since 1968. In her statement Dr. Chan stated that the H1N1 swine flu virus is “moderate in severity” and that “…a global outbreak of swine flu has begun.” Defined, a pandemic is a sudden outbreak that becomes very widespread – a global disease. An influenza pandemic occurs when a new influenza virus emerges for which there is little or no immunity in the human population, which causes it to spread easily worldwide. Although currently the disease has only infected 30,000 people to date (2% of which are labeled as “severe”), it is expected to continue to spread for up to six to nine months, typically in waves. This requires us, as employers and individuals, to heighten our awareness of such disease and engage in preparedness TODAY! If your own personal well being or the well being of those around you isn’t enough to get you motivated to take action, keep in mind that a worldwide influenza pandemic could have a major effect on the global economy – and we all know we don’t need any additional negative impacts on our economy! Knowing this, it is especially important for businesses today to prepare for this pandemic, possible future pandemics, and just “emergencies” in general. Whether it is a tornado, a flood, or even the sudden death of key personnel, emergency preparedness and business continuity plans will help guide personnel operationally during such a crisis and help organizations prepare properly for various emergencies. Will we just close the doors until the crisis is over? Will we try to open as soon as possible to provide the needed product or service? Will we sit and wait for a predetermined time and then begin operations? Determining these types of organizational objectives will provide the essential background to determine the direction of the plan and proper preparedness before a crisis to ensure the viability into the future. Admittedly, creating a preparedness plan is not an easy activity but it is will become our guiding document during such an event. Whether it is an eight hour power outage or a full pandemic influenza event that halts activities for weeks or maybe even months, this plan will help us prepare for those emergencies. With a plan in place, the document will also need to be supported by a solid backbone of policies and procedures for such emergencies. A complete review of potential policies and procedures impacted during an emergency is almost as essential as the plan itself. These policies and procedures should complement the goals of the organization to move to the resumption of activities as quickly and smoothly as possible. A list of some of the policy considerations you should consider follows. Do you have an emergency preparedness / business resumption plan? This type of plan is the first step in determining your actions in the case of a pandemic or other emergency type event. Does your sick time/paid time off or sick leave policy cover potential employee needs for cases of quarantine? Experts indicate that in the case of a pandemic outbreak individuals will be encouraged to maintain social distancing or self isolation. This would include encouraging employees to remain at home if they are sick or are caring for a sick dependent. Does your policy cover such an event that may last up to six weeks and encourage people to stay home if they have flu like symptoms? Have you considered the impact of pay and/or benefits if employees are off for that length of time? Does your emergency closure policy (for inclement weather, power outages, etc.) take pandemics into consideration? Experts propose that a pandemic could result in social distancing or self isolation for up to 45 days. Does your policy take into consideration that the company may be closed for multiple days, possibly even weeks? If you indicated people are paid partial pay, for example, during a closure do you provide a maximum of the number of days that would last? Do you address how their benefits will be affected? Have you considered federal and state laws that may impact these decisions? Do you address how pay is handled during a pandemic? Consideration here must be made for how pay is handled when operations are forced to close and/or individuals are asked to work from their homes. Again, don’t forget to consider federal and state laws when considering pay issues. Will you allow employees a flexible leave? Will you charge employees with accrued vacation or personal/sick time? Will you allow employees to take the time unpaid? Will you provide employees with administrative paid leave? Will you require employees to return within a certain amount of time once the pandemic has been “cleared”? Have you considered what will happen if they do not return when you require them to return? Do you have a communicable disease policy? This policy will allow for communication to prevent disease spread at the work site or how to handle cases where employees have been exposed at the work site. If possible, the policy should encourage employees with communicable diseases and/or symptoms to not come to work. Do you have policies and practices that encourage social distancing? During a potential pandemic, one of the best ways to limit transmission is to limit contact with one another. Consider policies and procedures that distance employees from each other, customer and the general public. Encourage telecommuting (if appropriate), work through email, websites, and/or teleconferences. Do you have a telecommuting policy or flexible worksite plan in place? Is it possible for your employees to work from home? Your organization may need to upgrade your technological capabilities but it will be invaluable if they are able to perform essential functions away from the workplace. Do you have a flex-time schedule that would allow your employees the ability to stagger work times? This type of a plan would assist in minimizing exposure and reducing potential transmission of the disease. Do you have an Employee Assistance Plan or some other arrangement to assist employees during a pandemic? An EAP will assist employees in managing the additional stress related to a pandemic. These will include stress related to illness, death, financial, and issues for some regarding the loss of a routine. Communication and social support will be important to reduce fear and worry. when they are too scared to report to work. Yes, planning for an emergency that can impact your organization and more specifically a pandemic is serious business. As with everything human resource professionals are involved in, preparedness is important. Like policy development, succession planning, recruitment, or professional development, preparedness is just one more thing HR professionals should be involved in to ensure proper preparedness for our companies. A lot of work? Yes. Worth it? Absolutely! As we absorb the reality of what is happening today, we can rest assured that the World Health Organization, Centers for Disease Control and other local public health professionals are doing everything they can to ensure we are aware of what is going on around us and to provide us with the necessary information to prepare for such a crisis. We need to take their lead and work with our organizations for proper emergency preparedness. Preparedness planning has and will pay off for everyone. Now it is up to you to take the next step for your organization to ensure you are prepared for emergencies, including pandemics – today and in the future. Patti Dunham, MBA, MA, SPHR is a Senior Human Resources Management Consultant and Manager Outsource Solutions with Strategic Human Resources, Inc. (www.strategichrinc.com). If you have questions or comments about this article, you can contact Patti at Patti@strategicHRinc.com. Our workforce is aging. “The curve of early retirement is flattened out, and people are staying on the job longer,” says Neal Cutler, PhD, Executive Director of the Center on Aging of the Motion Picture and Television Fund in Woodland Hills, California. A 2005 survey from Merrill Lynch found that 76% of baby boomers intend to work and earn in retirement. What has been set up to accommodate the aging boomers in the workforce? Wellness programs have been developed to address the physical, mental/emotional and stress effects that are taking a toll on older workers. However, there has been little if any attention directed to the aging brain. That is really an alarmingly low awareness level – because we are our brains. We protect institutional knowledge and the brain trust, but what happens with aging brains? Of all the organs in our body, the brain is the most demanding and intriguing. It has fooled even the most renowned neuroscientists. Up until a few decades ago these scientists believed our brains were pliable, or could be shaped by learning only until early adulthood. After that we had all the brain cells we were ever going to get. As it turns out, we maintain the ability to grow new brain cells – neurogenesis – throughout our entire life. We also have the ability to reshape out brain through learning – neuroplasticity – throughout our lives. These findings have completely changed everything in relation to our perceptions about how the brain functions. We definitely are at our cognitive peak in our twenties. The slippery road of cognitive decline starts around age thirty. The brain has such vast reserves that we don’t notice the losses we are sustaining until around the age of fifty. This is when we start to notice a slight acceleration in cognitive decline. It is then that we can’t find our keys; we skip introductions because we can’t remember names, we forget why we went to the grocery store and we better make a bee-line to the kitchen before we forget what it is that we went to get. These are all normal memory lapses. The processing speed of our brain slows down as we get older. The brain of a sixty year old is two to three times slower than a twenty year old. Neurochemical production slows down as we get older. We are very dependent on Acetylcholine and Dopamine neurotransmitters for communication and memory function. Acetylcholine is depleted in Alzheimer’s disease and Dopamine is depleted in Parkinson’s disease. So what has the research revealed to give us hope? The brain has the capacity to repair, reorganize and rebuild itself. The key to this phenomenon is brain fitness. There are several ways to achieve brain fitness at any age: through nutrition, physical exercise and brain exercise. Each of these components can have a profound effect on the brain but together the synergistic effect can reverse cognitive decline. What is good for the heart is good for the brain. Omega – 3 Fatty Acids are the rock stars of nutrition for brain health. DHA is the most abundant fatty acid in cell membranes. The human body produces DHA but not enough – so we need to get DHA from outside sources. Omega-3 fatty acids are found in fatty fish such as salmon. It is also in walnuts and flax seed. Of course it is available in supplement form. Research indicates that Omega – 3 might have the ability to reverse cognitive decline. It is important to eat fatty fish at least once a week. Our brains are extremely vulnerable to oxidative damage. Antioxidants in foods and vitamins are crucial to good brain health. The vitamins high in antioxidants are C, E and beta-carotene. Vitamin B12 becomes more critical to brain health as we get older. In fact, a person totally depleted in B12 can show signs of delirium. Vitamin B12 is found in protein based foods. Vitamin D is necessary for cognitive functioning. Red wine has powerful antioxidant properties and contains a nutrient called Resveratol. Research indicates that Resveratol has the ability to stop plaque formation from occurring in Alzheimer’s disease. Although this research is still in animal studies it is showing great promise. A controlled research study revealed that participants exercising for at least 45 minutes a day/ three times a week had the ability to hold off Alzheimer’s disease up to 32% (Annals of Internal Medicine). Through functional MRIs it was shown that physical exercise stimulated cell growth within the hippocampus – the center of learning and memory. These results are far more exciting than any of the medications that are on the market today. Aricept, Nameda and others slow down the progression of the symptoms of the disease. Physical exercise alone has better outcomes than any of these medications. The adage is – “Use it or lose it”. The question is – Use what or lose what? There is some controversy over this old adage of use it or lose it. We have a master pathway in our brain. It is here where most of our mental functions fall. It is our auto-pilot. So, when we do a crossword puzzle – it falls into our master pathway. We are not challenging the rest of our brain. We are not lighting up all of the rest of the machinery. We are not using it. So what do we have to do? In order for the brain to benefit from activities and exercise – it has to be challenged. Brain fitness activities have to push the brain to do things it has never done before. For example: challenge your brain to pick out the cello from a classical musical composition; learn to juggle; learn a new language. We have more brain cells than there are stars in the galaxy – it is time to start using them – so we don’t lose them. Brain fitness also involves speed of processing, getting back working memory, improving executive function and many other functions. Software developers have teamed with neuroscientists to bring brain fitness products to the marketplace. Nintendo opened the floodgates a few years ago with their Brain Age program. Since then many different software products have been introduced to the market. Happy Neuron is an on-line subscription based product consisting of 28 different computer game exercises focusing on a number of brain functions including memory, attention, language, visual-spatial skills and logic. Lumosity is also an on-line product addressing the same domain areas. MindFit is developed by CogniFit. Their programs are designed to boost cognitive skills including short-term memory, reaction times, recall and eye-hand coordination. Posit Science, out of San Francisco, has two programs on the market right now: The Brain Fitness Program, an auditory program that increases auditory processing speed by 131% and 10 years average improvement in memory; and Cortex with InSight a visual program that has shown a 300% faster visual processing speed and a 200% larger useful field of view. The programs by Posit Science have been heavily researched and all reported statistics are evidenced-based. Why should companies, organizations and the corporate world be paying attention to brain fitness? Up until now there has been virtually no attention directed to brain health within the parameters of wellness in the corporate setting. There has been no thought to corporate training as far as mental acuity is concerned. However, the aging workforce is going to force a reevaluation of this entire area. Cognitive issues are going to be brought to the forefront especially in high risk jobs. People 55 and over are expected to make up 23% of the workforce in 2016. Having employees who are cognitively fit becomes a bottom-line issue. Older workers have industrial knowledge from years of experience. Capitalizing on brain fitness by boosting memory and mental processing speed through brain exercises can significantly improve performance standards. Getting the most from a mature workforce translates into a competitive advantage. As these testimonials become more mainstream, brain fitness will be as much a part of corporate wellness programs as physical fitness programs are now. Fit bodies, fit brains – that will be the picture of tomorrow’s workforce. Bazaitis,A. (2008) The workforce landscape – graying but gritty. Aging Well 1 (4) p16. Frauenheim,E. (Jan.2008). Special report: training and hr technology – retrain the brain. Jarvis,R. (Feb.2009). Healthy Horizon: Brain Exercise. CNBC.